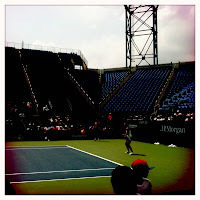 Going to the US Open has long been on my list of things to do in New York. With the Boy being borderline obsessed with the sport (and practicing it himself), I finally got to tick it off the bucket list. We took a day off to see some of the pre-tournament qualifying games and also got some tickets to the men's quarter finals which we took my sister to. Going to Flushing Meadows is a bit of a trek (for a Manhattanite at least) but well worth it. If you don't mind huge crowds, the atmosphere is electric and for me, catching a glimpse of the glittering Empire State Building in the distance while in the Arthur Ashe stadium, made it an unmissable New York experience.